I’ve had a Family Guy kind of a week, this week. Firstly, on Monday I popped in to a supermarket on my way home for lunch and found the series 8 box set had just been released. Randomly, this particular shop had just 2 copies left, from a huge display of them. So I had to buy it. 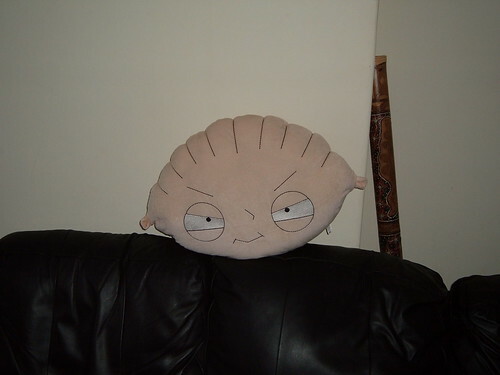 Yes, we’re skint (again), and not making any unnecessary purchases, but Family Guy…come on, I had to! We’ve already watched the entire series. Ha ha ha – hey Stewie! A didn’t quite see the funny side at first, but now it is the cause of many jokes. Mostly involving walking into the room to find someone else with the cushion in front of their face, quoting Stewie’s finest moments. To anyone who has never watched Family Guy, this probably doesn’t mean a great deal, but believe me, we’re laughing a lot. Also, a lot of people who have watched Family Guy find it too offensive to be funny, but I like it anyway. Anyway, on to knitting news. The shawl of doom is on hold. I am too upset to pay it much attention just at the moment. Suffice it to say, there wasn’t enough yarn to finish the border. 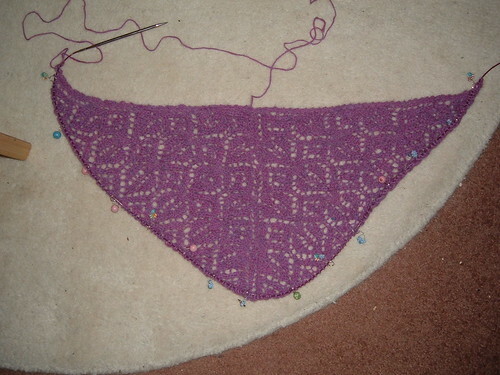 I have instead started a new shawl, for A’s cousin. It’s kind of a Thank You and a Happy Christmas in one, and she deserves it. The pattern is Heartland shawl, and the yarn is Artesano 4 ply alpaca. It’s so soft and lovely. The pattern is good, well written, but for some reason I keep getting rows confused and making mistakes. Really stupid mistakes. Maybe this isn’t a good television project. I don’t get much knitting time that isn’t in front of the box though, so I’ll just keep going. Between this and the shawl of doom, I have started to get really good at fixing mistakes in lace without tinking. I’ve also been plodding away at the cross-stitch Daisy picture, but no new photos as it doesn’t yet look all that different. I should probably give some thought to knitting something up to send to big bro and his family in America…I was planning on doing Mrs Christmas to match the Father Christmas I sent them last year. I dunno though, might cross-stitch some decorations instead. We’ll see. And finally, some good news. I’ve got the week off work! For no reason! I have hardly used any of my leave up this year, as I was focussed so hard on not taking time off sick and I forgot I could take leave. So I have this week to do whatever I want. Well, nearly. I have no money for a start. And between us we have 4 doctor and 2 dentist appointments. And A has overtime for the first time in ages. So I’ll probably just watch bad television, knit some, stitch some, take it easy. Of course I should do housework. Yeah, right! This entry was posted on November 7, 2009 at 12:05 pm and is filed under Cross-Stitch, knitting. You can follow any responses to this entry through the RSS 2.0 feed. You can leave a response, or trackback from your own site.